Kōshin'etsu (甲信越) is a subregion of the Chūbu region in Japan consisting of Tokyo, its environs and central-eastern Honshu. The area encompasses Yamanashi, Nagano, and Niigata prefectures. 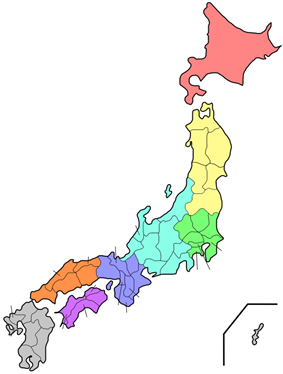 The name Kōshin'etsu is a composite formed from the names of old provinces which are adjacent to each other — Kai (now Yamanashi), Shinano (now Nagano) and Echigo (now Niigata). The region is surrounded by the Sea of Japan to its north west, Hokuriku region to its west, Tōkai region to its south west, Kantō region to its south east, and Tōhoku region to its north east. 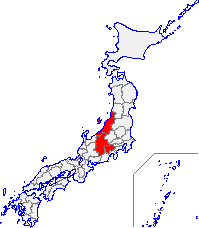 The name for this geographic area is usually combined with Kantō region (as in "Kantō-Kōshin'etsu"); and it is sometimes combined with Hokuriku region (as in "Kantō-Kōshin'etsu-Hokuriku" or "Hokuriku-Kōshin'etsu"). Nippon Telegraph & Telephone directories categorize phone numbers by region, including the Koshin'etsu area. The Japanese Society of Nuclear Medicine categorizes its membership by region, including the Kanto-Koshinetsu region. In Japan, the Children's Cancer Registry program is administered by seven National Children's Medical Registration Centers, including Kanto-KoShinEtsu. ^ Nakayama, Shigeru, Kunio Gotō and Hitoshi Yoshioka. (2006). A Social History of Science and Technology in Contemporary Japan: Transformation period, 1970-1979, p. 423. ^ Nihon Ginkō. (1990). Bank of Japan Monetary and Economic Studies, Vols. 8-9, p. 129. ^ a b "Abstracts from the 25th Kanto-Koshinetsu regional meeting of the Japanese Society of Nuclear Medicine" (JSNM), Japanese Journal of Nuclear Medicine (Jpn J Nucl Med) 23(10):1503-1511, October 1986. ^ "29th Kanto-Koshinetsu-Hokuriku Regional meeting of the Japanese Circulation Society," Japan Circulation Journal (1963), Vol. 27, No. 12, p. 907. ^ Nihon Denshin Denwa Kabushiki Kaisha. (1995). City Source English Telephone Directory: Greater Tokyo, Tokyo/Yokohama/Chiba, Nagoya, Sapporo, Sendai business directory, p. 887.